When I last wrote about my great-grandfather Isidore Schoenthal, he and my great-grandmother Hilda (Katzenstein) and their four children, Lester, Gerson, Harold, and my grandmother Eva had moved from Washington, Pennsylvania, to Denver, Colorado, around 1907, when my grandmother was just three, and her brothers were nineteen (Lester), fifteen (Gerson), and six (Harold). They moved out west because Gerson had severe allergies and asthma and the doctors had recommended a drier climate than western Pennsylvania. My great-grandfather, who had been a glass and china merchant in Pennsylvania, became a salesman and then a store manager for the Carson Crockery Company out in Denver. 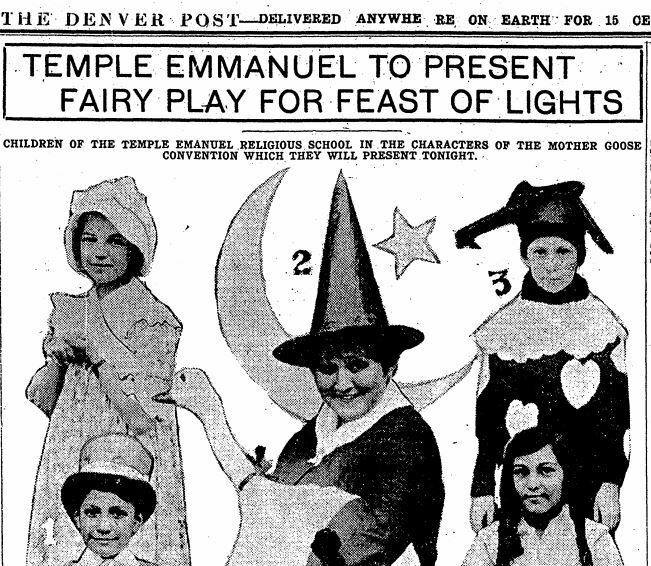 Temple Emanuel is the oldest Jewish congregation in the state of Colorado, founded in 1874. It is the largest Jewish congregation between Kansas City and the West Coast. It had its early beginnings in a burial and prayer society that was organized in 1866. By 1874, two years before Colorado became a state, the congregation was officially incorporated by 22 members. 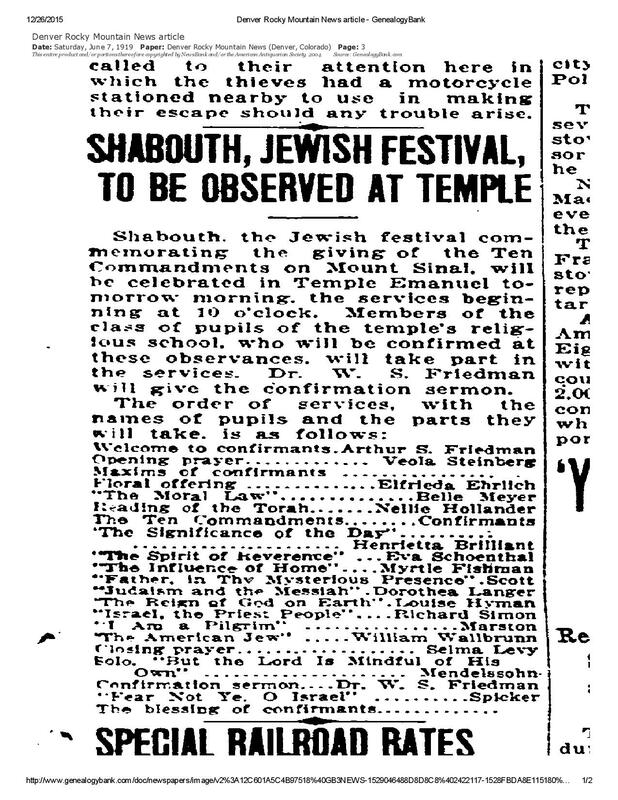 Within the first year membership was almost doubled and on September 28, 1875, its first synagogue was dedicated. This was located at what is now the corner of 19th and Curtis streets. 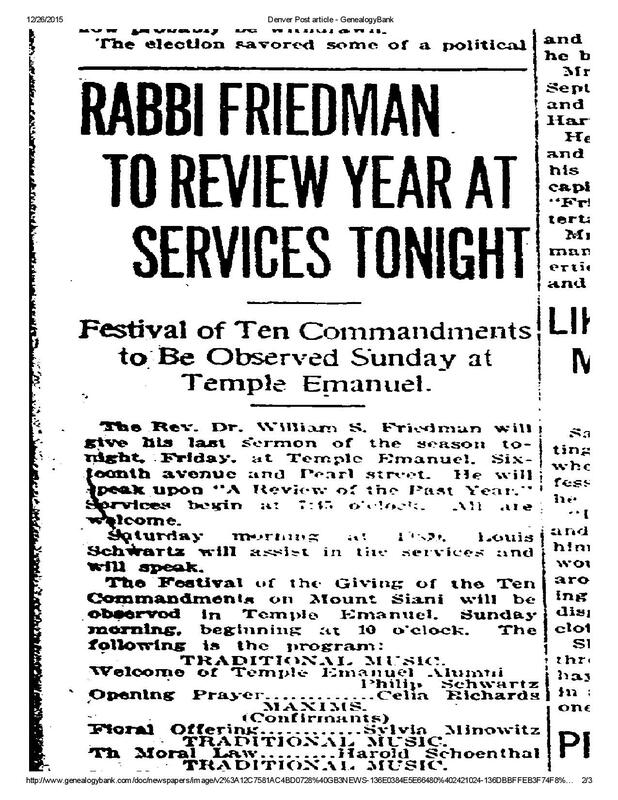 Early in 1876, the congregation engaged its first full-time rabbi. The congregation grew and prospered with the community. It soon outgrew its original home. 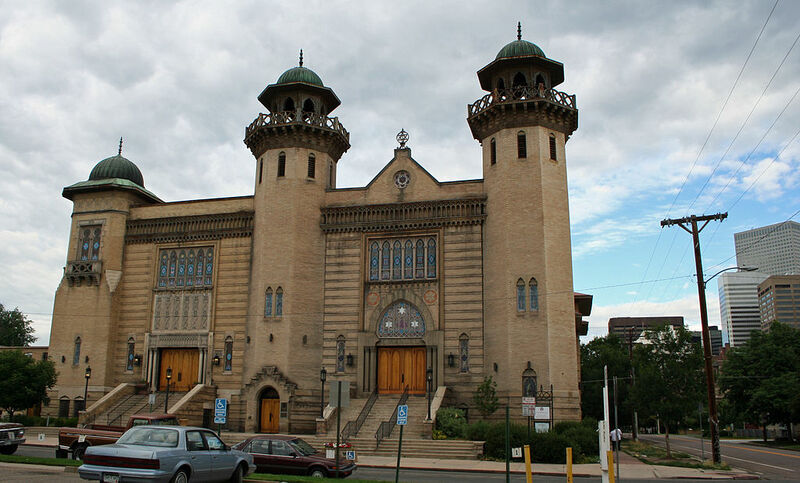 By 1882 a new synagogue was erected at 24th and Curtis Streets. Even though this structure was gutted by fire in 1897, the building still stands today. After the fire, the congregation decided to build at another location because many of its members no longer lived near Temple. The location at 16th Avenue and Pearl streets was chosen. In January of 1899, our third home was dedicated. In 1924 this building was doubled in size. Many Orthodox Jews settled in Denver seeking a cure for tuberculosis, the “white plague.” Two Jewish institutions were founded to respond to their needs and other sufferers of consumption from around the country. The National Jewish Hospital for Consumptives was opened in 1899. Its name was changed in 1985 to the National Jewish Center for Immunology and Respiratory Medicine. It is now the National Jewish Medical and Research Center, with a worldwide reputation in the research and treatment of allergy and pulmonary diseases. The Jewish Consumptives Relief Society was established just outside of Denver in 1904 to serve the religious needs of suffering Orthodox Jews. The Golda Meir House Museum is where the future Israeli Prime Minister (1898-1978) lived with her sister and brother-in-law Shayna and Sam Korngold and niece Judith during 1913 and 1914, after she ran away from parents’ home in Milwaukee—she learned that they had a husband picked out for her…and that married women were not allowed to teach there. In her 1975 autobiography, My Life, she states, “It was in Denver that my real education began…” The Korngold house was considered a social and intellectual haven by numerous Jewish immigrants from Russia (Golda’s family had left Kiev in 1906), most of whom had traveled out west for medical treatment. In this environment, Goldie discussed politics, met her future husband Morris Meyerson and developed her future political philosophy. She became deeply involved with Zionism and made the decision to emigrate to what was then Palestine. 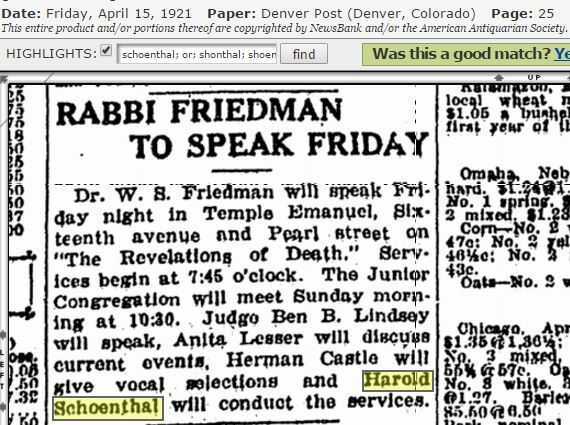 Golda was only a teenager when she moved to Denver, not much younger than my great-uncle Gerson and only three years older than my great-uncle Harold. I wonder if she or the Korngolds ever crossed paths with my relatives. In 1910, my great-grandfather continued to work as the manager of the crockery store. Lester, now 22, was in the US Navy, working at a hospital, and Gerson, 18, was working as a clerk in an office, according to the census record. Both were still living at home with their parents. 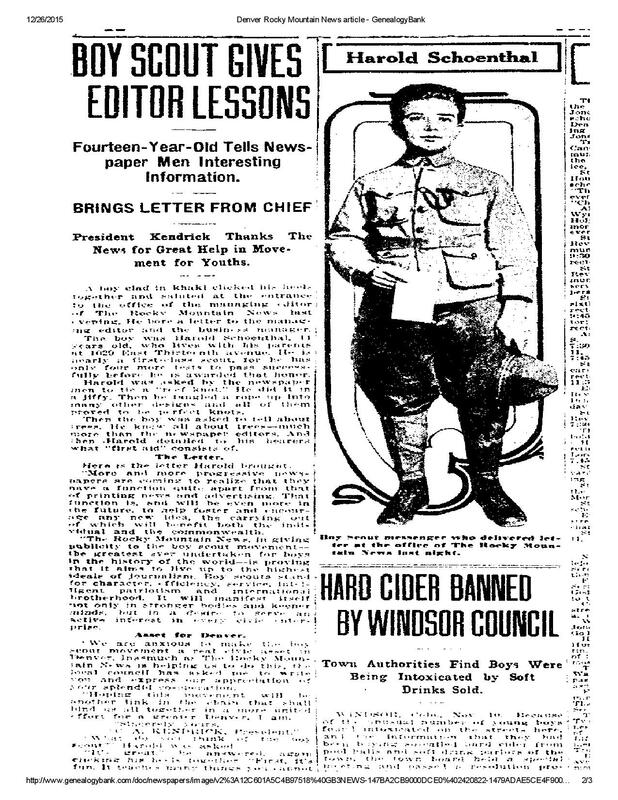 Boy Scouts continued to be a big part of his life, as I found several news articles listing him as a member of the Scouts. While Harold and Eva were still growing up, the other family members were busy working. My great-grandfather Isidore and his middle son Gerson were employed in various ways during the 1910s, while Lester spent much of those years in the Navy. In 1913 Gerson was a clerk for the Sam Lang Importing Company, and my great-grandfather Isidore now seemed to be in the insurance business. (Interestingly, his brother Henry, who had also been a merchant for many years, had also turned to the insurance business after 1910.) The following year, 1914, Isidore was a bookkeeper for Court Place Liquor Company. But in 1915, Isidore is listed once again working for the Carson Crockery Company as a foreman, and Gerson was a salesman for the Sam Lang Importing Company. Even Harold, now fifteen, had a separate listing in the 1916 Denver directory, but without an occupation listed as he was still in school. 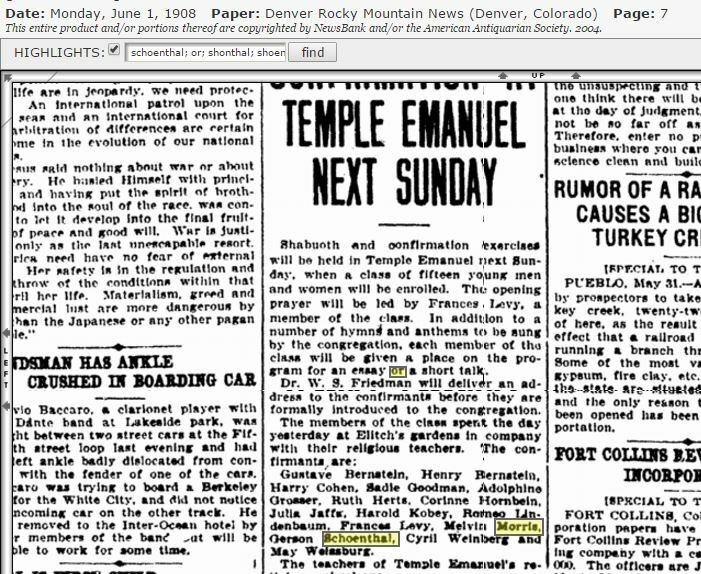 Harold was confirmed at Temple Emanuel in the spring of 1916; he was fifteen. 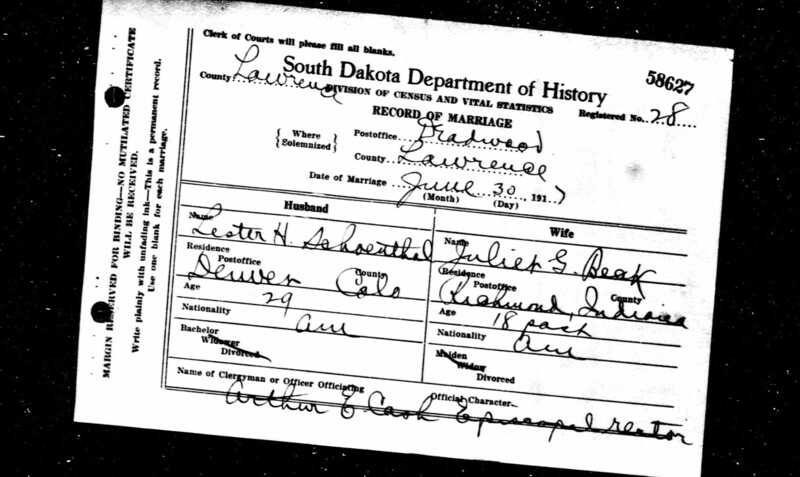 On June 30, 1917, Lester Schoenthal married Juliet Grace Beck, sometimes referred to in later documents as Grace and sometimes as Julia. Although Juliet was from Richmond, Indiana, and Lester from Denver, they were married in Deadwood, South Dakota, by an Episcopal rector. Lester, no longer in the Navy, had been living at home and working as a traveling salesman for the Carson Crockery Company, according to the 1917 Denver city directory. Perhaps he had met Juliet while traveling for work. Ancestry.com. South Dakota, Marriages, 1905-2013 [database on-line]. Provo, UT, USA: Ancestry.com Operations Inc, 2005. Original data: South Dakota Department of Health. South Dakota Marriage Index, 1905-1914, 1950-2013 and South Dakota Marriage Certificates, 1905-1949. Pierre, SD, USA: South Dakota Department of Health. She was the daughter of Charles Benton Beck and Inez Cockayne, both of whom were born and raised in Indiana. Her father was a salesman in a retail store in Richmond, Indiana, in 1910, and perhaps Lester had worked with him as the representative of Carson Crockery. Juliet was only 18 and had already been married briefly when she married Lester in 1917. But why were they married in Deadwood, South Dakota? It’s true that Deadwood was a thriving town back then. It had grown from a frontier town with a lot of gambling and prostitution at the time of the Black Hills gold rush in the 1870s to a well-settled town of over 3,000 by the time Lester and Juliet were married there. The railroad by then connected Deadwood to the east and west, but that still doesn’t explain why they would have gotten married there. Deadwood is almost 400 miles from Denver and almost 1200 miles from Richmond, Indiana. Did Lester and Juliet elope? Perhaps my great-grandparents didn’t approve of Lester marrying someone who wasn’t Jewish and/or Juliet’s parents didn’t approve of her marrying someone who was? It sure seemed a long distance to go to get married in a place where neither family lived, especially in the era before planes and destination weddings. 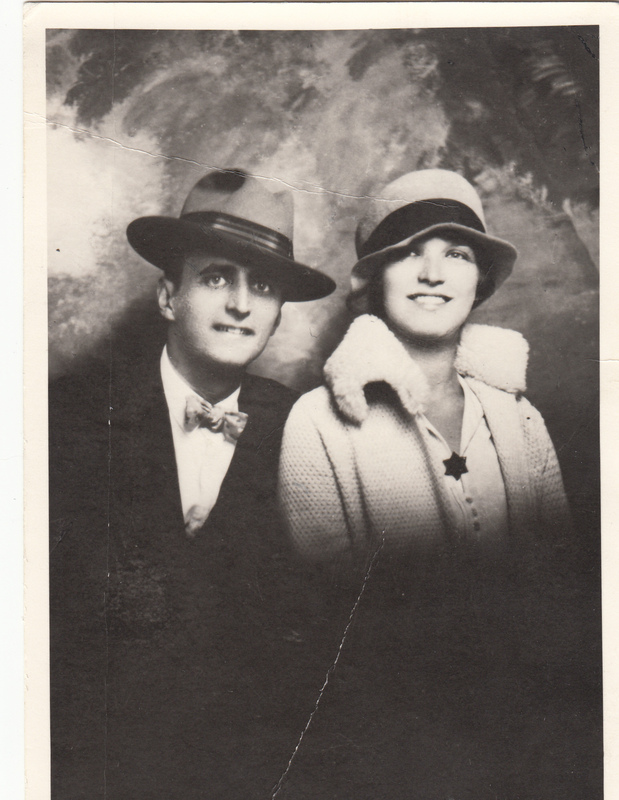 Lester and Juliet settled in Colorado Springs after the wedding where, according to the 1918 directory for that city, Lester was working as a manager for the Boss Rubber Company. 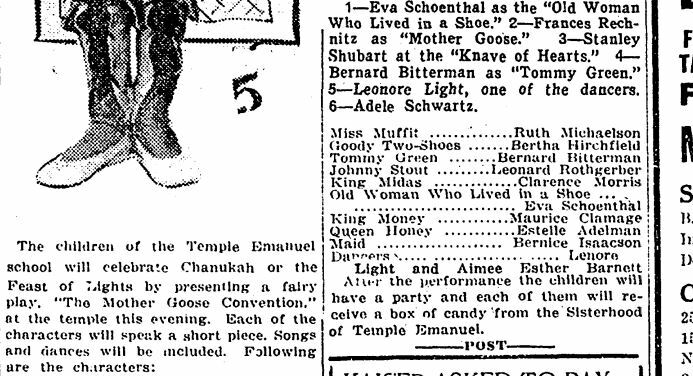 My grandmother continued to participate in dramatic performances for the synagogue, taking part in the Hanukkah production again in December, 1917. She is depicted here on the far right of the top row. She was then thirteen. In 1919, Lester and his wife had moved from Colorado Springs to Denver, where he was now working as a salesman for the Frankel Carbon & Ribbon Manufacturing. His brother Gerson was a buyer for the Golden Eagle, and his father Isidore is listed as a clerk for the Carson Crockery Company. Lester was living with his parents at 1029 13th Avenue in Denver where they had been living for several years, but Gerson had moved out and was living at 530 St. Paul Street. In 1920, my great-grandparents had only their two youngest children living at home: my great-uncle Harold, who was now eighteen, and my grandmother Eva, who was fifteen, as of the date of the census. According to the census, Isidore was a manager for the crockery company (I assume the 1919 directory was mistaken in listing him as a clerk). As for their oldest son, Lester, as of the 1920 census, he and Juliet had moved to Richmond, Indiana, where they were living with Juliet’s parents and siblings. Lester was working as a representative for a rubber company. His father-in-law, Charles Beck, was now the postmaster in Richmond. I have two listings for Gerson on the 1920 census. On one, which is dated January 10, 1920, Gerson was listed at 530 St. Paul Street as he was in the 1919 Denver directory, and he was married to a woman named Gratice. Gratice was born in Iowa, and her parents, Frank and Maude Johnson, were born in Missouri. They had moved to Colorado by 1900 when Gratice was three. But there is a second listing for Gerson on the 1920 census that is not dated. On that record Gerson was living on 19th Street in Denver in a large lodging house, was working as a commercial salesman, and was listed as single. I would have assumed that this was an earlier record since he was not yet married, but since the census record listing him with Gratice at that address is dated January 10, 1920, it would seem unlikely that the undated census was taken before January 10. Plus since he was living at 530 St. Paul Street in the 1919 directory and as of January 10, 1920, it seems unlikely that Gerson had moved from 530 St. Paul Street to 19th Street and then back to St. Paul Street by January 10. At any rate, Gerson was married to Gratice in subsequent years, so the January 10, 1920 record appears to be accurate. I’ve no idea what to make of the other census record. 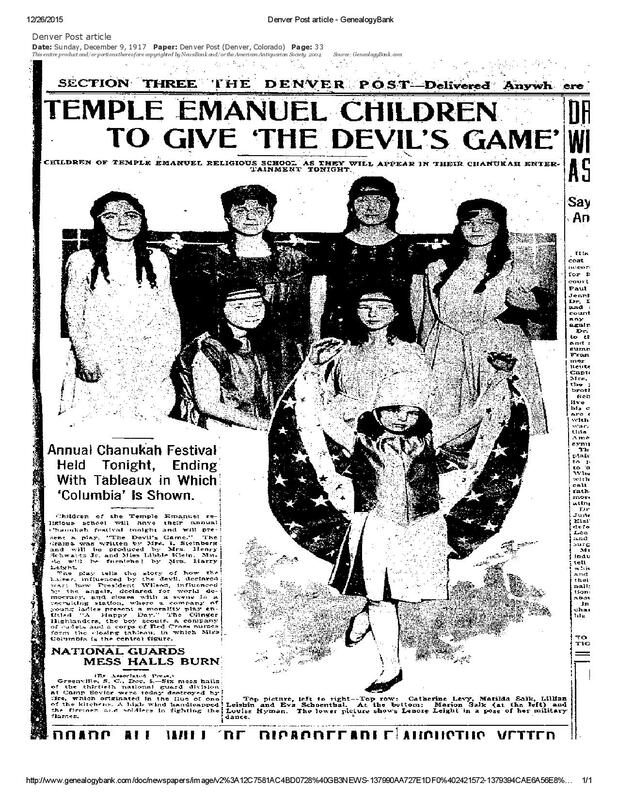 Year: 1920; Census Place: Denver, Denver, Colorado; Roll: T625_160; Page: 12B; Enumeration District: 165; Image: . In 1922, my great-grandfather continued to work for the Carson Crockery Company as a department manager, and Gerson was working as a commercial traveler for the Sun-Maid Raisin Growers (a product I add to my cereal every morning). Lester and Juliet had returned from Indiana to Denver, and he was working as a manufacturer’s agent; his wife Juliet (Julia G here) was working as stenographer. Even my grandmother was included in the listing. Only Harold was missing; he must have left for college at that point. Harold started his college studies at the University of Colorado and finished at Columbia University, where he studied architecture. 1922 Denver directory Ancestry.com. U.S. City Directories, 1822-1995 [database on-line]. Provo, UT, USA: Ancestry.com Operations, Inc., 2011. 1922 was an important year for my grandmother. She graduated from East Denver High School that year where she had been part of the Progressive Club (a music group, not a political group, as I had initially thought), a Big Sister, and a member of the Drama Club. I guess her roles in the Hanukkah plays were just a small part of her teenage acting career. Eva Schoenthal high school yearbook picture Ancestry.com. U.S., School Yearbooks, 1880-2012 [database on-line]. Provo, UT, USA: Ancestry.com Operations, Inc., 2010. Original data: Various school yearbooks from across the United States. 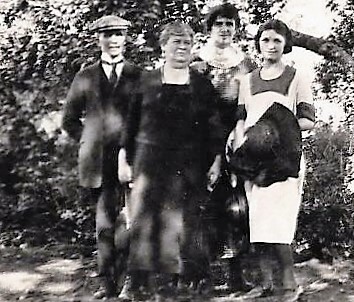 As the 1920s moved on to the 1930s, much was going to change for my grandmother and her family. I will pick up with that part of the story after I return from a short break away from blogging. In the meantime, happy New Year to you all. May 2016 bring everyone peace and good health and happiness. And may the world find some way to preserve our planet, to create a world where our children and grandchildren can be safe at home and at school and elsewhere, and to protect all its people from terrorism and despots and demagogues and from prejudice and hatred and fear. We all wish for that, don’t we? There must be a way we can get there without all the rancor and stupidity and fear-mongering that seems to dominate our air waves and our political process. At least I hope we can. This entry was posted in Denver, Genealogy, Schoenthal and tagged Colorado, Deadwood, Denver, Golda Meir, Judaism, South Dakota by Amy. Bookmark the permalink. My very best wishes to you too Amy, for a happy, safe and successful year ahead. I’m looking forward to your new researches and learning more about your family. Happy New Year! Su. Thanks, Su, and same to you! I am enjoying your photos, and I hope you have a chance to get back to genealogy also in 2016! 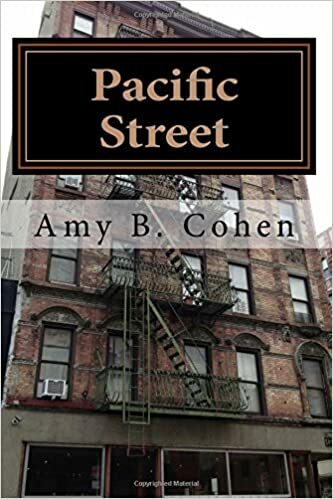 Amy, I am continually amazed at all the local newspaper clippings you find about your family and I love reading about your family’s stories. Happy New Year! It’s so much fun finding them—one of my favorite parts of the research. It’s time-consuming, and often I find nothing, but I’ve also had some really good luck. I’d never seen childhood pictures of my grandmother before! Enjoy your time off. Happy New Year! Thank you— to you also! Amy, what a treasure trove of goodies in this post! Your blog is like a compendium of Jewish-American history!!! LOVED the children’s religious school activities!!! Me, too! I knew nothing about their Jewish upbringing so this was a real revelation to me. I do love the newspaper searches! There are some lovely pictures in this post, Amy! You’ve done such thorough research and you bring the stories of your ancestors to life so vividly they become almost like personal memories. Of course I wish you all the joys and all the best for your New Year – however late I am in wishing them! It’s never too late for a New Year’s wish—same to you! And thank you for the kind words. Coming from someone with your writing skills, it means a lot. 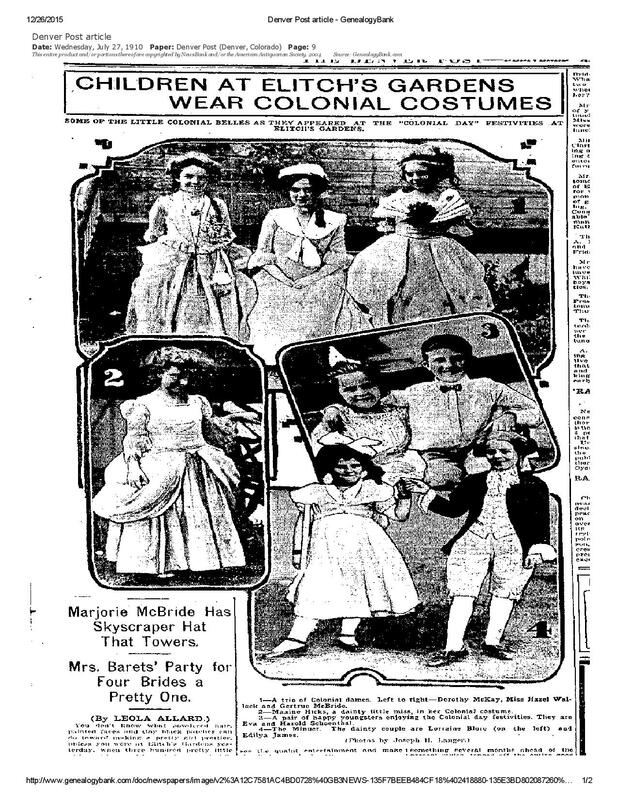 Two of my favorite things is old photographs and newspaper clippings. This is such an interesting post and you must be continually thrilled to have the window into the lives of your family that your excellent research provides. THank you. I do love finding those news articles, and I wish I had MORE old photos! It’s so exciting to get those insights into their lives. Thanks for reading and for your kind words! !